The words of the Canadian soldier–doctor–poet John McCrae are called to mind every year on 11 November, for it was his poem “In Flanders Fields,” written amid the suffering of the First World War, that inspired the adoption of the poppy as the symbol of remembrance. Born in Canada in 1872, John ­McCrae studied medicine and served in the South African War before embarking on a career as a physician. Dianne Graves brings to life McCrae and his world in fascinating detail, setting her narrative against a background of half a century of history. She explores all facets of his life, among them his medical career and capacity for hard work; his love of travel; his popularity in the highest social circles, in Canada and London; his interest in poetry, art and literature; and the connections that led him to meet many notable personalities of his era – among them Rudyard Kipling, Sir William Osler, Roald Amundsen, Lord Northcliffe, Sir Alexander Fleming, Lord Strathcona and Stephen Leacock. As the story of McCrae’s life unfolds, so do the events that led Europe to war in 1914 and to Dr. John McCrae volunteering for service with the Canadian Field Artillery and the Canadian Army Medical Corps. 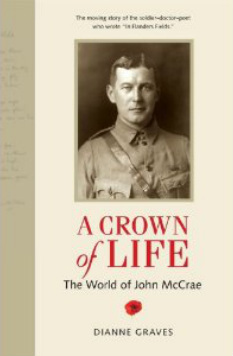 The years 1914–1918 are seen through McCrae’s eyes and those of his friends and colleagues who volunteered to fight “For King and Country.” The events leading up to the writing of “In Flanders Fields” during the Second Battle of Ypres in May 1915 are explored in detail. Dianne Graves recounts the impact of John McCrae’s poem on four people who were instrumental in poppies being worn every year to honour the war dead of Britain, Canada, the United States and other Allied nations.